Puig HI-TECH Footpegs with ergonomic design. 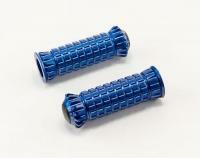 - Less weight to 90 grams (racing footpegs and racing footpegs with rubber) and 130 grams (trail footpegs). - Available in different colors (heads only in black). PUIG offers two footpegs models for R bikes, naked and maxiscooter and one model for trail bikes. IMPORTANT: ALL OUR FOOTPEGS MOUNTED THE SAME ADAPTERS.